This beautiful creature I just met in our garden: a diamond python, Morelia spilota spilota. 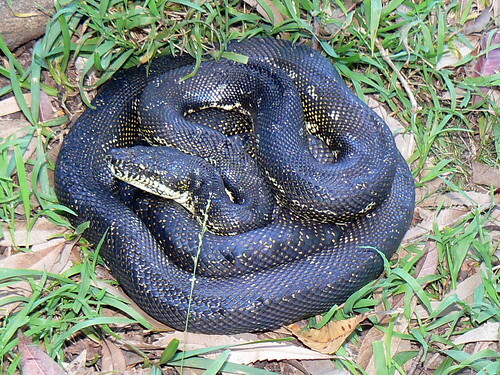 Diamond pythons are found in bushland around the east coast of New South Wales and Victoria. In Victoria, it is considered endangered due to loss of habitat. They grow up to 4 metres long, and this one, I'd estimate, is around 2 metres. It was basking next to our compost bin, probably because at night it becomes a smorgasbord for visiting mice. Diamond pythons are nocturnal, and kill their prey by constriction. Their diet is small mammals and lizards. Unusually for snakes, the female diamond python nurtures her eggs by incubation. That image (from my Statcounter) is a little blurry, but it shows that My Growing Passion leapt from a daily twenty or thirty unique visitors to nearly four hundred over three days. My photos on Flickr also generated masses more traffic. Which just goes to show... not sure exactly what, except that I've been neglecting this blog unforgiveably and having lots of new visitors has reminded me of that. If you don't know Pharyngula and are not averse to the unabashed rantings of a brutally frank atheist-evolutionary scientist, you'll find much to enjoy there. It's become one of the blogs I simply must read every day. PZ's energy is amazing.